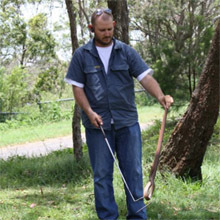 David Martin is a Snake Catcher located on the north side of Brisbane. He has had a love for all wildlife since his first job at the former Bunya Park Wildlife Sanctuary which once existed at the back of Eatons Hill. There he frequently encountered snakes as they tried to enter cages, avairies and anywhere food was stored. David's main areas of operations are north and north west of Brisbane. However if available David is happy to travel further to help out in an emergency. Shown here is David with a Carpet Python which was removed from a house in Albany Creek. Matt has a truely extensive knowledge of snakes and animals in general. He has been an animal enthusiast all his life and kept reptiles for much of it. Matt's experience with snakes as well as his calm and professional manner makes him a snake catcher you can count on! Not only is Matt a licensed snake catcher he also has experience with animal rescue and foster. Matt has the experience, knowledge and equipment that allow him to help out most injured native animals. Matt cover's much of the Brisbane's southern suburbs. Much of Matt's recent work has been in the Logan and Sailsbury areas. Pictured here is Matt with a Carpet Python that had found a comfy bed in a house at Mount Gravatt. 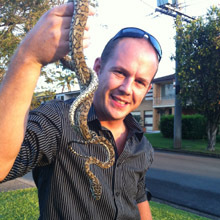 Specialising in snake removal in Brisbane Matt can also be found at BrisbaneSnakeCatcher.com.au. 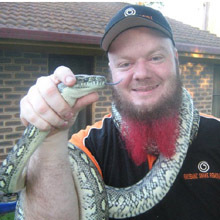 As well as being a licensed snake catcher David is also a zoo keeper at Rockhampton Zoo. After looking after animals all day David finds the best way to unwind is to... look after animals. David's animal experience dates back many years. Both his full time zoo keeper job and part time snake catcher job allow him to be immersed in the field he truely loves. Here you can see Dave relocating an Eastern Brown. This technique is known as tailing and is made safe through the use of the snake hook to limit it's ability for a successful strike. You can see David is keeping a close eye on his captive as the Eastern Brown is known to be happy to bite and is the second most venomous land snake in the world. Definately not a snake to fool around with. 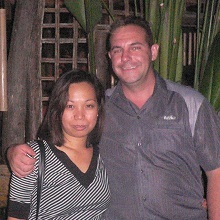 If you are traveling through sunny Rockhampton be sure to check out the zoo and say g'day to Dave. Not only is Michael a snake catcher he also conducts environmental work and bush regeneration in the area of health and safety. Through his father Michael was fortunate to be exposed to reptiles from an early age. He grew up in Frankston victoria where he was fortunate to see my fair share of Tiger snakes and Redbellys. In Michaels teenage years he performed reptile rehab Mainly blue toungs Skinks and today i work for a company that holds a rehabilitation permit and still performs some rehabilitation. Michael's memorable moments include a call from cleveland Police to remove a carpet python on the giveway sign at the roundabout as it was freaking out people. A snake in ceiling in Thornlands turned out to be a goanna. A brown tree snake rescued from tape in a factory in cleveland and my all time favorite removing a red belly from a boxed in freezer motor in birkdale. There was also a spotted python i removed from a house in birkdale that i'm sure was a lost pet as the people living in the house had moved in recently and this creature was the most puppy dog personality i had ever seen in a wild snake. One amazing call was for a brown tree snake curled up in the toilet roll in the womens toilets at Golden Circle. If you live in the Bayside area of Brisbane Michael is your closest contact!